Over the Martin Luther King, Jr. weekend, Ellie, Ben and I visited Shenandoah Valley, guests of Shenandoah County Tourism. We stayed in the charming town of Woodstock, which is central to just about everything there is to do in the valley. As we planned, the forecast called for temperatures in the 40s and 50s. That didn’t change for weeks — and then, the day of the trip, winter made a forceful, frigid arrival! Yikes! Let me tell you, in the mountains when the wind is whipping, it is cold — sooooo cooolllldddd! That’s not to say it’s not fun. Oh my gosh — we had a blast. It sure helped that we packed (borrowed) ski pants, winter boots, heavy gloves, hats and scarves. Wrapped up nice and cozy, the wind didn’t stand a chance. Woodstock, the county seat for Shenandoah County in the Shenandoah Valley but not home to the national forest (did you get that? ), is a great spot for winter adventure getaways. It’s central to skiing, snowboarding and snow tubing at Bryce Resort and horseback riding or wagon rides at Fort Valley Ranch. When you need a break from the outdoors, the area has several museums, caverns and shops to explore. Perhaps the best way to describe it is adventure meets history meets quaint. Can you picture it? When planning the trip with Shenandoah County Tourism, we had a rather long wishlist of things to do. What follows is our family recommendation for a weekend in Shenandoah. We had a five hour drive, so our first day, we wanted to exercise those car-stiffened muscles. 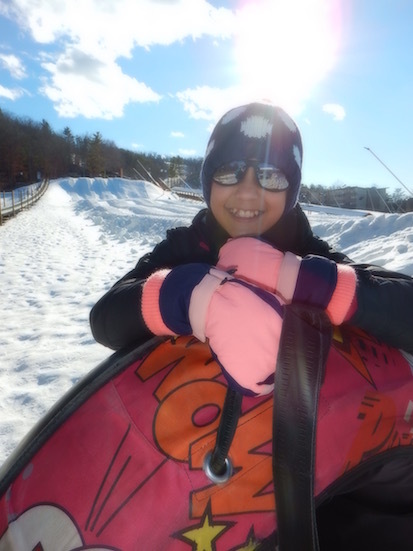 Snow tubing at Bryce Resort was exactly what we needed! This small ski resort on the western edge of Shenandoah County is well-known for its friendly staff — and the snow tubing staff met the standard. They weren’t just friendly, they were engaged. They seemed to genuinely care that guests enjoyed themselves. Booked for a 2-hour session mid-afternoon, the snow-tubing course was fast. Manmade snow from the weekend had melted with the previous day’s heat and hardened to ice by the time we arrived! Unlike the sledding of my youth, the snow-tubing course has a conveyor belt escalator to the top of the hill. NO uphill climbing required! SCORE! As for the slides themselves, they are carefully groomed, monitored for safety and speed, and offer loads of fun! I was apprehensive my first run, so the crew did not spin me or push me fast. After that, though, I was all about faster and crazier — we spun. We raced each other. We never got cold and we had a ton of fun! From there, we checked into our hotel, had dinner and unwound for the evening. The next day was bitterly cold with really high winds. We scrambled to adjust our schedule for the weather and headed to indoor activities. Cold we could manage — the wind, not so much. You know? Our visit to the Shenandoah Valley Heritage Museum at the Edinburg Mill was a highlight. Docents had us watch the movie, The Burning, before exploring the museum. The movie chronicles the Civil War history of the area, when Union troops came through the valley to burn the farms and kill cattle and chickens in hopes of starving the Confederate Army. This particular part of American history is not taught in most schools, so we found the movie quite enlightening. The museum itself houses historical items and collections donated by local citizens. There’s a huge American Red Cross display, old clothes, war memorabilia and collections of goods from local businesses. An old business safe and grain weighing scales are there for hands-on exploration. Of all we saw, the movie was our favorite part. Next, we headed over to Route 11 Potato Chips for a factory tour. Started in 1992, the factory still makes chips in small, carefully seasoned batches. Guests can watch the process from potato to chip through large viewing windows of the pristine factory (no photography allowed), sample all the flavors and purchase fresh-made chips. Our salty chip craving satisfied, we headed to Shenandoah Caverns for a tour of this underground wonderland. The temperature in the caverns averages about 56 degrees year-round, so it felt really warm compared to howling winds above-ground. If you visit in summer, though, bring a sweater! 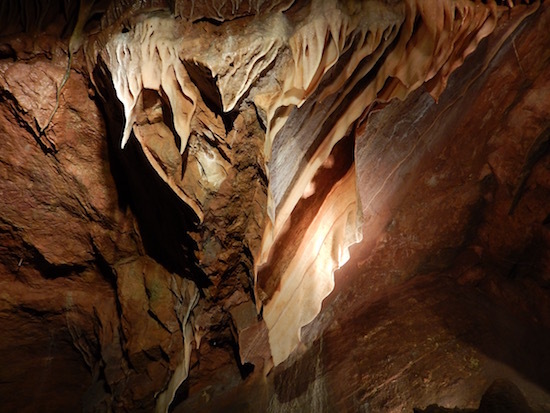 The caverns were discovered in the late 1800’s by two brothers who used it as their underground playground. Photos do not do this place justice! The stalactites and stalagmites that we learn about in middle school science are enormous and the whole place feels otherworldly. We had a leisurely lunch at Sunrise Cafe, a local restaurant just south of Woodstock that comes highly recommended by everyone (EVERYONE! Our hotel desk staff, the ladies at the pharmacy, the owner of the llama farm.) Service here is NOT fast, as each item is cooked to order, but the food is delicious with hearty portions. Sandwiches come with Route 11 potato chips, of course! 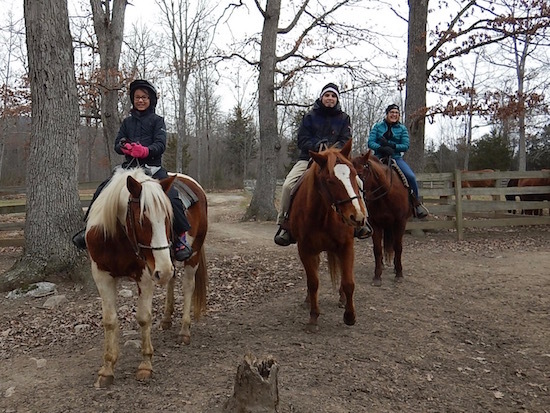 Before heading home ahead of Winter Storm Jonas, we took Ben horseback riding. Ellie and I loved it in Arizona and wanted him to get a chance to ride. As a mom, it was kind of fun watching him be the nervous one trying something new and his LITTLE sister getting to be the encourager. We got lost on the way to Fort Valley Ranch, so here are the directions you really need: From Route 11, turn EAST (if going southbound, that’s left) onto Edinburg Gap Road. When the road ends at a funky intersection, take the sharp right (there’s a small sign pointing to the ranch, but we missed it) and keep driving until you see the ranch on the right. Our guide, Elizabeth, was gracious about our tardiness. She said people get lost all the time — and GPS signals are unreliable in the area. She had us sign the safety waiver, talked with each of us about our comfort level on horses, fitted Ellie with the required helmet and then explained how to ride a horse. Saddled up with clear instructions on how to ride, we set off to explore the mountain trails. Through the whole ride, Elizabeth pointed out things of interest, shared the history of the ranch, and kept a close eye on us all. The conversation was relaxed, as if we’d known each other forever. I go on lots of tours in my travels, and Elizabeth was absolutely THE BEST guide I’ve ever had, a perfect balance of professionalism, guide and friend. I think I could have ridden all day. But… there was this storm on the way. So we went home, driving through crazy snow and wind instead. Shenandoah is a great weekend destination for adventurers, golfers, history buffs, antiques shoppers and fans of the arts. Lodging and dining are both quite affordable. Consider the time of year when planning your trip, though! Shenandoah County Wine and Beer Trail, featuring 11 local breweries and distilleries. 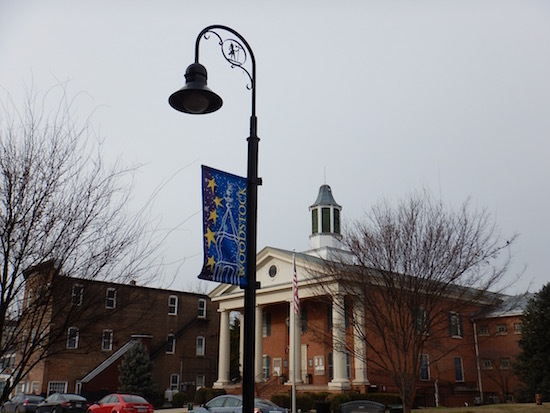 O Shenandoah County Artisan Trail, featuring local artists throughout the region. Shenandoah Valley Kids Trail, hosted by Bucket! Our thanks to Shenandoah County Tourism, Bryce Resort, the Edinburg Mill and Fort Valley Ranch for hosting us. 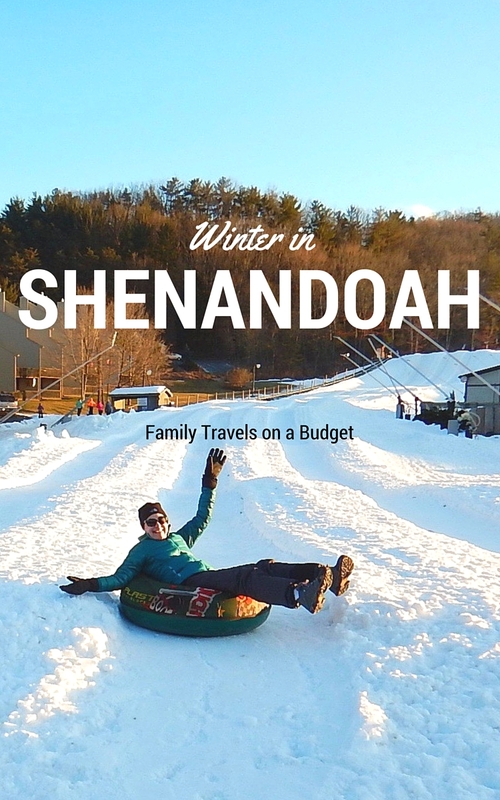 Winter in Shenandoah is wonderfully fun! This looks like such a fun place to visit! I’m in Florida and would love to be in snow right now! This is a great place to visit, with or without snow! We don’t get much snow at home, so I am glad this is close by. Will have to save this idea for another winter getaway. We loved Gatlinburg this year. Gatlinburg is great, too. This is less commercial and less crowded! Such a quiet little area but still so much to do! Love it there. Can’t wait to go back.